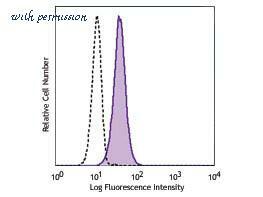 Detection of CD19 in Human PBMCs by Flow Cytometry. 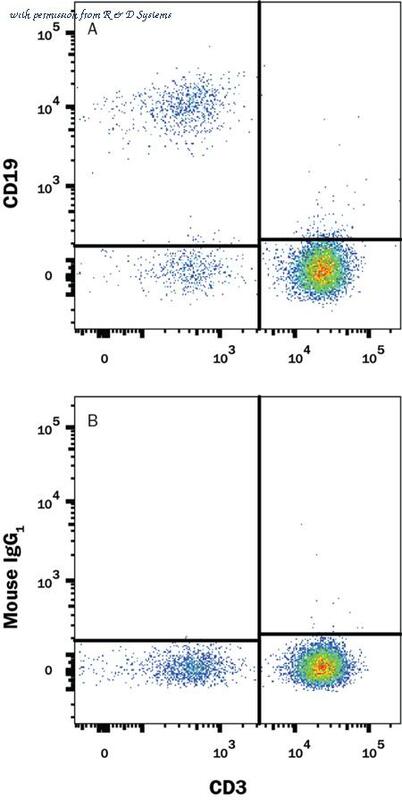 Human peripheral blood mononuclear cells (PBMCs) were stained with Mouse Anti-Human CD3 epsilon PE-conjugated Monoclonal Antibody (Catalog # FAB100P ) and either (A) Mouse Anti-Human CD19 Monoclonal Antibody (Catalog # MAB4867) or (B) Mouse IgG1 Isotype Control (Catalog # MAB002 ) followed by Allophycocyanin-conjugated Anti-Mouse IgG Secondary Antibody (Catalog # F0101B ). 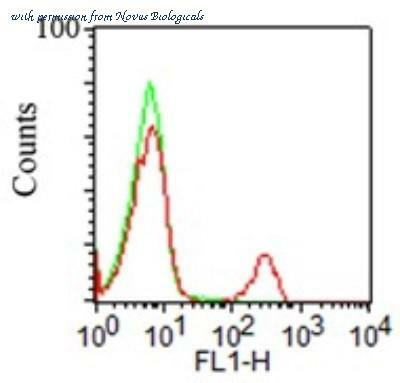 Detection of CD19 in Human PBMCs by Flow Cytometry. 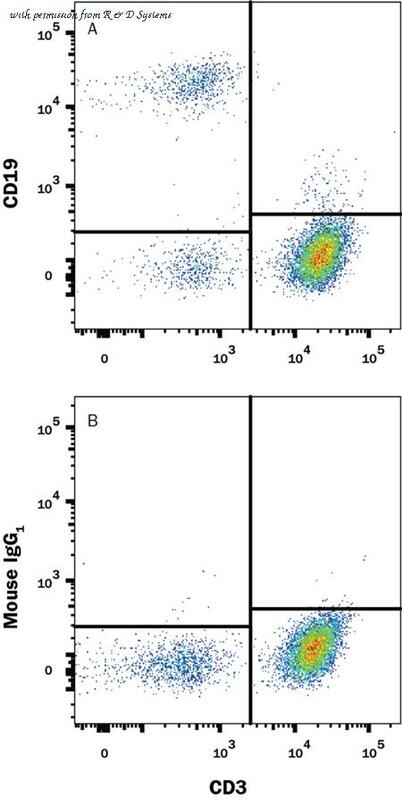 Human peripheral blood mononuclear cells (PBMCs) were stained with Mouse Anti-Human CD3 epsilon PE-conjugated Monoclonal Antibody (Catalog # FAB100P ) and either (A) Mouse Anti-Human CD19 APC-conjugated Monoclonal Antibody (Catalog # FAB4867A) or (B) Mouse IgG1 Allophycocyanin Isotype Control (Catalog # IC002A ). View our protocol for Staining Membrane-associated Proteins . 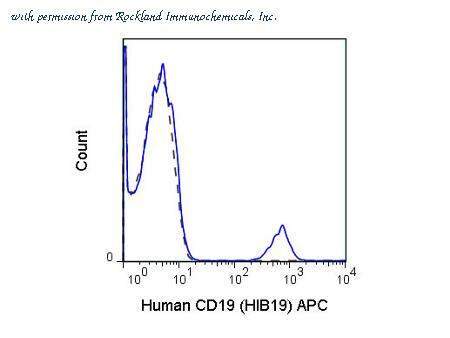 Detection of CD19 in Human PBMCs by Flow Cytometry. 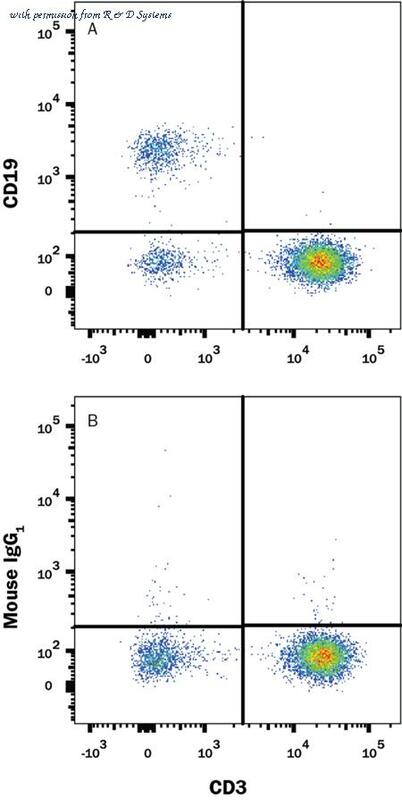 Human peripheral blood mononuclear cells (PBMCs) were stained with Mouse Anti-Human CD3 epsilon APC-conjugated Monoclonal Antibody (Catalog # FAB100A ) and either (A) Mouse Anti-Human CD19 Fluorescein-conjugated Monoclonal Antibody (Catalog # FAB4867F) or (B) Mouse IgG1 Fluorescein Isotype Control (Catalog # IC002F ). View our protocol for Staining Membrane-associated Proteins . HEK293T cells were transfected with the pCMV6-ENTRY control (Left lane) or pCMV6-ENTRY CD19 (Right lane) cDNA for 48 hrs and lysed. Equivalent amounts of cell lysates (5 ug per lane) were separated by SDS-PAGE and immunoblotted with anti-CD19. IHC of paraffin-embedded Human lymphoma tissue using anti-CD19 mouse monoclonal antibody. Anti-CD19 mouse monoclonal antibody immunofluorescent staining of COS7 cells transiently transfected by pCMV6-ENTRY CD19. Immunohistochemical staining of mouse fetal brain tissue using CD19 antibody. 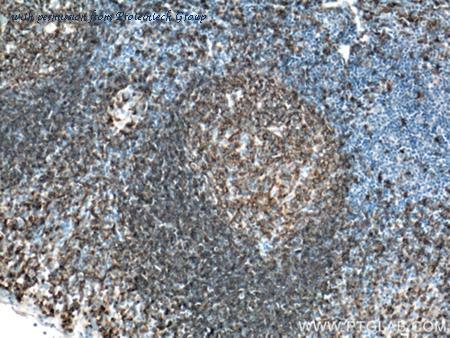 Immunohistochemical staining of mouse spleen tissue using CD19 antibody. 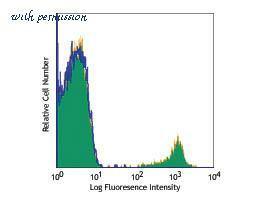 Flow cytometric analysis of Mouse Splenocyte Cell using CD19 antibody. 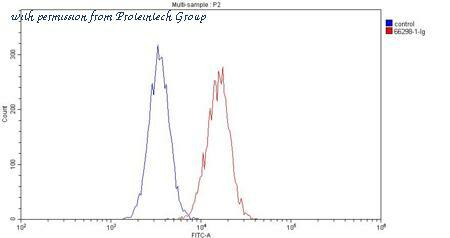 The CD19 antibody from Proteintech is a mouse monoclonal antibody to a recombinant protein of human CD19. This antibody recognizes human antigen. 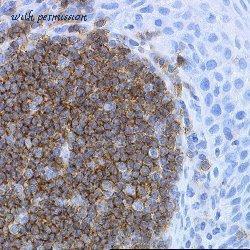 The CD19 antibody has been validated for the following applications: ELISA, WB, IHC analysis. 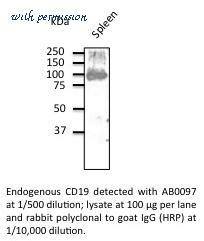 The CD19 antibody from Proteintech is a rabbit polyclonal antibody to a recombinant protein of human CD19. This antibody recognizes human antigen. 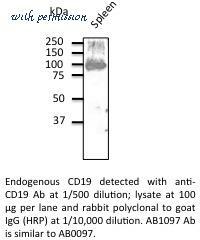 The CD19 antibody has been validated for the following applications: IHC, WB, ELISA analysis. 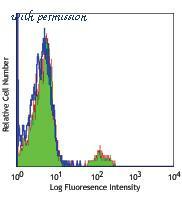 Flow Cytometry of Mouse anti-CD19 Fluorescein Conjugated Monoclonal Antibody. Cells: human peripheral blood lymphocytes. Stimulation: none. Antibody: (BLUE) FITC Mouse IgG1 kappa isotype control; (GREEN) Fluorescein Anti-CD19 mouse antibody using 5 ul. Flow Cytometry of Mouse anti-CD19 Phycoerythrin Conjugated Monoclonal Antibody. Cells: human peripheral blood lymphocytes. Stimulation: none. Antibody: (GREEN) Phycoerythrin Anti-CD19 mouse antibody using 5 ul. Flow Cytometry of Mouse anti-CD19 Allophycocyanin Conjugated Monoclonal Antibody. Cells: human peripheral blood lymphocytes. Stimulation: none. Antibody: (Dotted Line) 0.25 µg APC Mouse IgG1 isotype control; (BLUE) Allophycocyanin Anti-CD19 mouse antibody using 5 ul (0.25 µg). Flow Cytometry: CD19 Antibody (1D3) [NBP2-24965] - Analysis using the PE conjugate of NBP2-24965. Staining of CD19 in BALB/c mouse splenocytes using 1 ug of this antibody. Green represents isotype control ; red represents anti-CD19 PE. 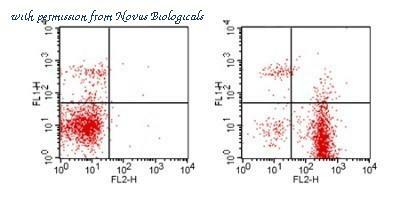 Flow Cytometry: CD19 Antibody (1D3) [NBP2-24965] - Analysis using the PE conjugate of NBP2-24965. Staining of CD19 in BALB/c mouse splenocytes. Cells were stained with anti-CD4 FITC this antibody and either 1 ug of isotype control antibody (left, ) or 1 ug of anti-CD19 PE (right). 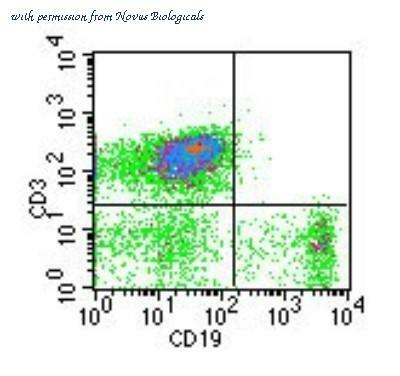 Flow Cytometry: CD19 Antibody (1D3) [NBP2-24965] - Cell surface analysis of CD19 in mouse splenocytes using this antibody. com/antibody_details.php?catalog=this antibody. 25 ug/10^6 cells. 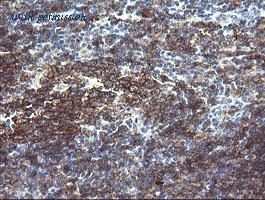 anti-rat PE secondary and cell surface staining kit were used in this test. 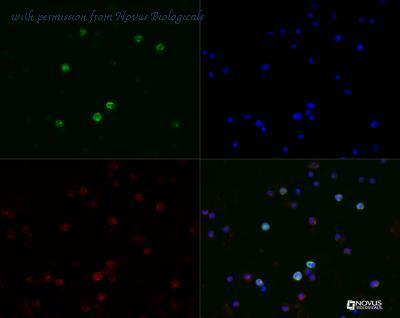 Flow Cytometry: CD19 Antibody (CB19) [NBP2-25196] - Analysis using the Alexa Fluor (R) 700 conjugate of NBP2-25196. Staining of human PBMC. Image from verified customer review. 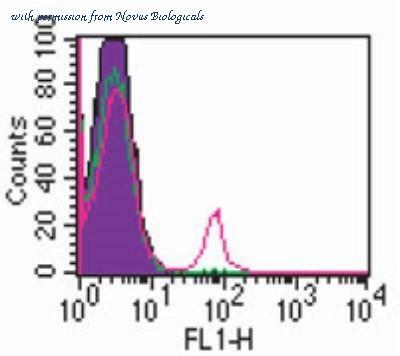 Flow Cytometry: CD19 Antibody (CB19) [NBP2-25196] - Surface staining of 10^6 human lymphocytes using 0.2 ug of CD19 antibody (red) and isotype control (green). Cell surface staining kit was used for this test. 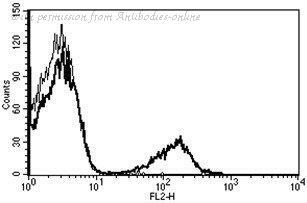 Flow Cytometry: CD19 Antibody (CB19) [NBP2-25196] - Analysis using the FITC conjugate of NBP2-25196. Staining of CD19 in 10^6 human lymphocytes using 10 ul (0.25 ug) of this antibody. 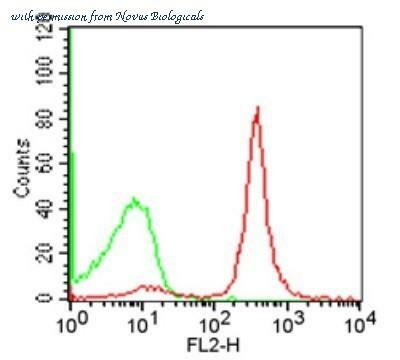 Shaded histogram represents cells without antibody; green represents isotype control ; red represents anti-CD19 antibody. Immunohistochemistry-Frozen: CD19 Antibody (SJ25-C1) [NBP1-28375] - CD19 (red) stained in human skin, counterstained with DAPI (blue) at 20x. Tissue fixed with 4% PFA, permeabilized with 0.5% Triton, and blocked with 37% Egg DI, 5% Milk DI, and 3% FSG 2% BSA TBS Ca/Azide in that order. Anti-CD19 applied at 1:500 v/v, 4C, O/N. 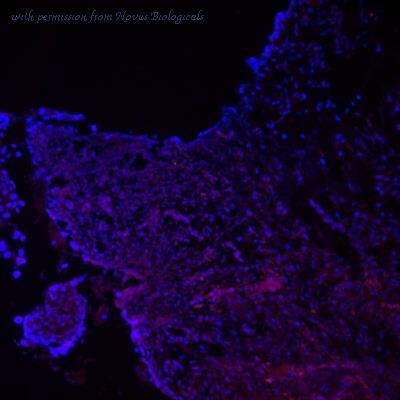 Alexa Fluor 568 secondary antibody, with DAPI counterstain. Image from verified customer review.